Orphaned as a baby, Robinson began performing in local beer gardens at age six. Within two years, this young "hoofer," or song-and-dance man, was entertaining audiences far from home. 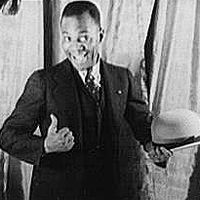 He performed on stage in "vaudeville," shows featuring numbers by dancers, singers, comedians, and actors. By the time he was a young adult, he earned top dollar dancing on the vaudeville circuit and in nightclubs. You may have seen him in old movies, dancing alongside a little dimpled girl with golden curls. Can you guess who she was?